He was speaking at a meeting with the Polish and British foreign ministers. Ukrainian President Petro Poroshenko has said the seizure by Russia of Ukrainian assets in Donbas is another evidence of Russian occupation of the east of Ukraine, according to UNIAN. "There was another brutal and dreadful violation of international law – Russia has de facto confiscated Ukrainian state and private assets located in the occupied territory. This is another evidence of Russian occupation of eastern Ukraine," he said at a meeting with Secretary of State for Foreign Affairs of Great Britain Boris Johnson and Minister of Foreign Affairs of the Republic of Poland Witold Waszczykowski in Kyiv on Wednesday. He also called for the introduction of sanctions against individuals who illegally appropriate Ukrainian assets: "Sanctions should be applied against those who will enter into the so-called possession of confiscated assets for the violation of international and Ukrainian legislation." Poroshenko also noted that the Kremlin had been demonstrating escalation of the situation in eastern Ukraine. Particularly, he pointed out to the issue of security: a drastic increase in the number of shelling incidents and casualties among civilians and the Ukrainian military, as well as the use of heavy artillery. The Ukrainian president recalled that in the course of the Munich Security Conference, Russian President Vladimir Putin approved a decision to recognize documents issued by the so-called Donetsk People's Republic (DPR) and Luhansk People's Republic (LPR). Poroshenko said that this was taking place against the background of actual pulling these areas in the "ruble zone," gas and power supplies from Russia, the introduction of direct budget transfers. "This is absolutely clear confirmation of the fact that the territory is occupied by Russian troops along with full control over the state border in the uncontrolled area. 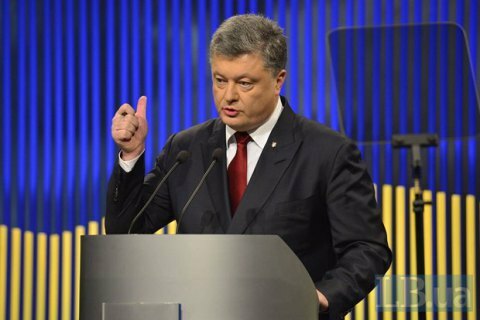 In this regard, we emphasize that Russia bears full responsibility for violation of the ceasefire, the murder of Ukrainian troops and civilians, illegal detention of hostages both in the occupied territory and in Russia," Poroshenko said.